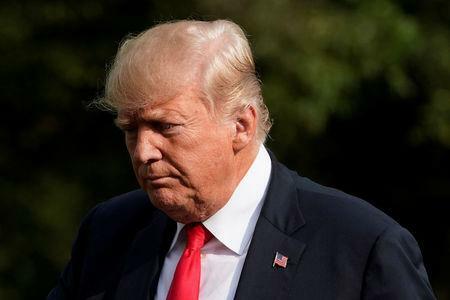 WASHINGTON (Reuters) - President Donald Trump plans to sign an executive order as soon as Wednesday that will slap sanctions on any foreign companies or people who interfere in U.S. elections, based on intelligence agency findings, two sources familiar with the matter said. Trump’s decision coincides with intelligence agencies, military and law enforcement preparing to defend the Nov. 6 congressional elections from predicted foreign attacks even as Trump derides a special counsel investigation into Russian interference in the 2016 elections. Sanction targets could include individual people or entire companies accused of interfering in U.S. elections by cyber attacks or other means, a U.S. official told Reuters. "The administration is keen to set a new norm in cyberspace," the official said. "This is a first step in stating boundaries and publicly announcing our response for bad behavior." The order represents the latest in a series of Trump administration efforts to look tough on election security before voting in November that will decide whether Trump's Republican Party can keep its majorities in both the U.S. House of Representatives and the Senate. The order will put a range of agencies in charge of deciding if meddling occurred, led by the Office of the Director of National Intelligence, and including the CIA, the National Security Agency and the Homeland Security Department, the sources said. Based on a recent draft of the order reviewed by the U.S. official, it will require any federal agency aware of election interference by foreigners to take the information to the office of Director of National Intelligence. Election interference will be defined in the order as hacking attempts against "election infrastructure," and efforts to sway public opinion through coordinated digital propaganda or systematic leaks of private political information. U.S. intelligence officials have found that in the campaign leading up to the 2016 U.S. presidential election, Russian hackers breached the Democratic National Committee and leaked confidential information. The Washington Post and the Wall Street Journal previously reported on earlier drafts of the executive order. Congress has been purposefully left out of the executive order drafting process, the official said, because the administration wants to preempt legislation being considered in the House and Senate that addresses similar issues. U.S. lawmakers have introduced various pieces of Russia-related legislation, including the "Deter Act," to set out punishments for election meddling, and what one lawmaker called a sanctions bill "from hell" to punish Moscow for cyber crime and its activities in Syria, Ukraine and elsewhere. Both Democrats and Republicans are looking to redress what they consider Trump's weak stance on accusations of Russian interference in 2016 when he met Russian President Vladimir Putin at a summit in July. Trump stunned the world by accepting Putin's denials over the word of his own intelligence agencies. Congress passed a Russia sanctions bill more than a year ago. Some lawmakers - including some Republicans as well as Democrats - have chafed at what they saw as the administration's reluctance to implement it. Trump signed the bill only after Congress passed it with huge majorities. Acting on that law, the U.S. Treasury imposed major sanctions against 24 Russians, striking at allies of Putin in one of Washington's most aggressive moves to punish Moscow.